All short story collections are available at your usual ebook retailers, but by buying directly from this website the Ministry receives the maximum return. 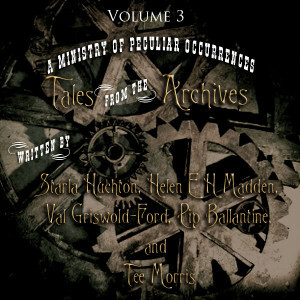 Tales from the Archives are short stories set in the world of the Ministry of Peculiar Occurrences. They explore events mentioned in the novels, characters seen and unseen and may include novel teasers of things to come. This volume includes: The Evil that Befell Sampson by Pip Ballantine– Eliza D Braun is a young field agent in the Ministry of Peculiar Occurrences (South Pacific Branch) when she is asked by New Zealand’s preeminent suffragist to investigate some strange goings within the organisation. Dust on the Davenport by O M Grey – Agent Simon R. Boswell, still considered the green agent of the Ministry, takes on his own a supposed haunting in Islington. The Astonishing Amulet of Amenartas by Nathan Lowell– Agent Heathcliff Durham finds himself crisscrossing Africa, looking for an Amulet that could spell disaster for any who come near it. A Ruby in Rain by Grant Stone – From the farthest edge of the Empire, New Zealand agents Lachlan King and Barry Ferguson are called to interview a recent arrival to Auckland’s prisons. 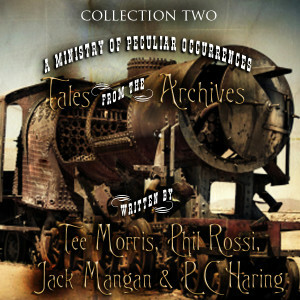 Tales from the Archives are short stories set in the world of the Ministry of Peculiar Occurrences. This volume includes: Darkest before Darkwater by Tee Morris– A group of survivors from the airship Guy Fawkes find themselves washed ashore on an uncharted island. The Shadows of Calcutta by Phil Rossi– Agent Robert Smith, on return from a mission in Nepal, is diverted to India where he is charged to find a missing agent. Night’s Plutonian Shore by Jack Mangan– In 1849 when a poet is murdered in the streets of Baltimore. The man behind the seemingly random murder manages to elude the law until — in 1889 — Agents Bruce Campbell and Brandon Hill track him down. The Seven by P C Haring– Agent Brandon Hill is on assignment in South America, enjoying the local culture and women, when a mystery that could lead to El Dorado falls into his lap. Before the intrepid agent knows it, he is the jungle uncovering a plot but the devilish Illuminati. He will need all his monkey knife fighting skills to survive this one. 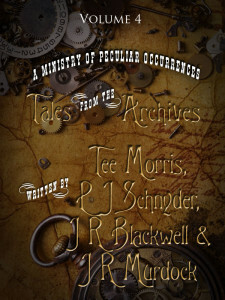 Tales from the Archives are short stories set in the world of the Ministry of Peculiar Occurrences. This volume includes: From Paris with Regret by Starla Huchton– On assignment in the City of Light, Ministry agents Eliza D. Braun and Harrison Thorne chase down a murderer condemning descendants of a royal bloodline to a horrific death. Hanuman’s Gift by Helen E H Madden- Deep in the Archives, Augustus Whitby toils through his duties in the Archives, dreaming up romantic stories far more plausible than the supposed “investigations” of the field agents. A story from Agent Harrison Thorne and an unassuming artifact from his recent case, however, proves much to Whitby’s chagrin that there are some truths that are far stranger than fiction. The Sun Never Sets by Val Griswold-Ford– Agent Isaac Martin receives a note, imploring him to investigate the nearly completed clock tower at the Palace at Westminster. The Precarious Child by Pip Ballantine– The street urchins that will one day be called the Ministry Seven, have a task from Agent Harrison Thorne. It seems simple enough, however their leader Miss Verity Fitzroy discovers that a surprise from her past is tangled up with this mysterious man which leads to a very precarious situation. Tales from the Archives are short stories set in the world of the Ministry of Peculiar Occurrences. This volume includes: Sins of the Father by Tee Morris—Arthur Books welcomes home his son, Wellington, from the jungles and deserts of Africa. The returning war hero, though, has returned more than a decorated soldier in Her Majesty’s Army; and Arthur collects on an investment spanning across decades. A Swan in Siam by P.J. Schnyder. Phailin is not your typical personal guard to the King of Siam. This royal protector of secrets finds herself intrigued by a guest of the British Ambassador’s, the enigmatic John M. Alvey of the Ministry of Peculiar Occurrences, and his quest for a swan possessing mythical powers… Women of the Empire by JR Blackwell. Wellington Thornhill Books and Doctor Josepha Raven Blackwell share ‘an encounter’ after-hours at the Ministry, all part of Dr. Blackwell’s research into hysteria. The Emperor’s Fist by JR Murdock. Agent Reginald Coffey and Special Liaison Meiying Ling are deep within the jungles of China, setting technology against the oldest of dark Chinese magic. 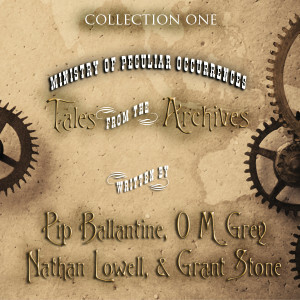 Tales from the Archives are short stories set in the world of the Ministry of Peculiar Occurrences. This volume includes: The Wrong Camera by Catherine Ford — Blythe is very excited to receive a camera for her birthday, but finds that gifts can have their price. A Trick of Strong Imagination by Alyson Grauer — Althea Galway, a gifted statistician for the Ministry of Peculiar Occurrences, follows her tedious pursuits for Doctor Sound to a Winter carnival and a strange mystery at its heart. The Cross of Columba by Doc Coleman — Agent Bryan Teague travels from the London offices to a remote area of Scotland on the call of Lord Pennyfarthing, a self-proclaimed scientist and specialist in ancient and rare fauna. Agent Teague arrives to find his skepticism of Pennyfarthing’s previous follies on finding a traumatised valet and a dying English lord with an incredible fish story… Curtain Call by Shaun Farrell — Cordelia is called to a strange theatre by a message from her estranged father, and she hopes for a joyful reunion. Her father though has been treading on dangerous ground while trying to impress the Director the Ministry of Peculiar Occurrences. 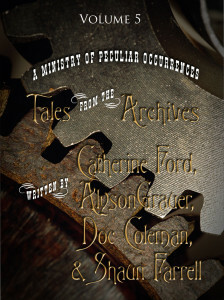 Tales from the Archives are short stories set in the world of the Ministry of Peculiar Occurrences. This volume includes: Positively Shocking by Tee Morris — Constance Magee is not a street urchin, not a thief, not a lost soul in the street of London. She is a girl surviving Her Majesty’s Empire one day at a time, nursing a sense of right and wrong, And sometimes, that sense doesn’t always see eye-to-eye with the law. After being jailed for her latest stand against injustice, she is extended an unexpected opportunity from a strange fellow named Doctor Sound… All That Glitters by Dan Rabarts — Agents Lachlan King and Barry Ferguson are called to an isolated mining town to investigate the disappearance of a young Chinese girl. Lost Waters by Kreg Steppe — Agent Daniel Pleasant is assigned to the United States of America to track down some missing items from the Archives. Pleasant is partnered up with a clankerton from the Office of the Supernatural and Metaphysical, and together the two set off to track the missing Archive items, their power rumoured to be able to bend time and space itself. The Taniwha of Ana Cove by Lewis Hoban — Doctor Josepha Blackwell’s love of strange fauna has bought her to the wilds of New Zealand to track down whatever is responsible for a rash of disappearances. 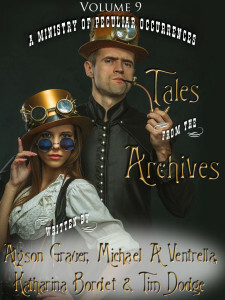 Tales from the Archives are short stories set in the world of the Ministry of Peculiar Occurrences. This volume includes: Under Oak Island by K T Bryski — Agent Brandon Hill is called in to investigate strange happenings in Nova Scotia. The location is an isolated stretch of land called Oak Island, a truly peculiar place with mystery and peril surrounding it. At the Money Pit, a man-made excavation site at the island’s heart, Hill meets up with Agent Anouk Tremblay, le Ministère Officiel d’Occurrences Sans Explication. Wooden Go to Waste by Sandra Wickham — Agent Cora Thorton finds herself in the forests of Canada, land she knows well as it was where she grew up in before joining the Ministry. Paired up with a junior agent, Cora steps into a rivalry between two lumber barons and the mystery surrounding six men disappearing in the dense forests, never to be seen again. Why the Sea is Boiling Hot by Michael Spence — Researcher Dodgson is happy in the bowels of the R&D department of the Ministry of Peculiar Occurrences, until a mysterious death and the question of space and time fling him out of it. Those Dark Satanic Mills by Suna Dasi — Agent Imogen Feaveryear finds herself investigating a mysterious panic overcoming a mill in the countryside of Manchester, England. The unassuming mystery, dismissed by other agents of the Ministry, leads her to India, the approval of Doctor Sound on granting the young agent the latest in R&D technology. This case only twists and turns harder as Imogen confronts an enigmatic intruder, obviously aware of her clandestine work. 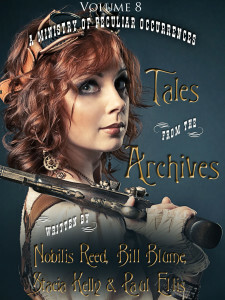 Tales from the Archives are short stories set in the world of the Ministry of Peculiar Occurrences. This volume includes: Blessings of Baalshemin by Nobilis Reed. In the Spring of 1869 Mrs Isabel Burton begins a correspondence with the Ministry of Peculiar Occurrences Director, Woodruff Spring, on a strange device she has run across in her travels. Bitter Pill by Bill Blume. 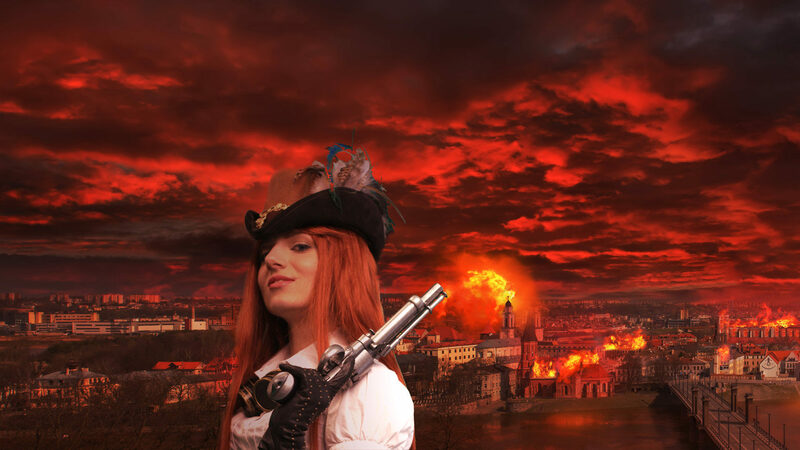 Miss Sharpe is not used to working for the Ministry of Peculiar Occurrences. She is used to being a killer for hire, the Jade Dagger, an artisan of death. Yet when called on to find an immortal in the city of her birth, she finds herself unprepared for what she discovers. Clockwork Portal by Stacia D Kelly. 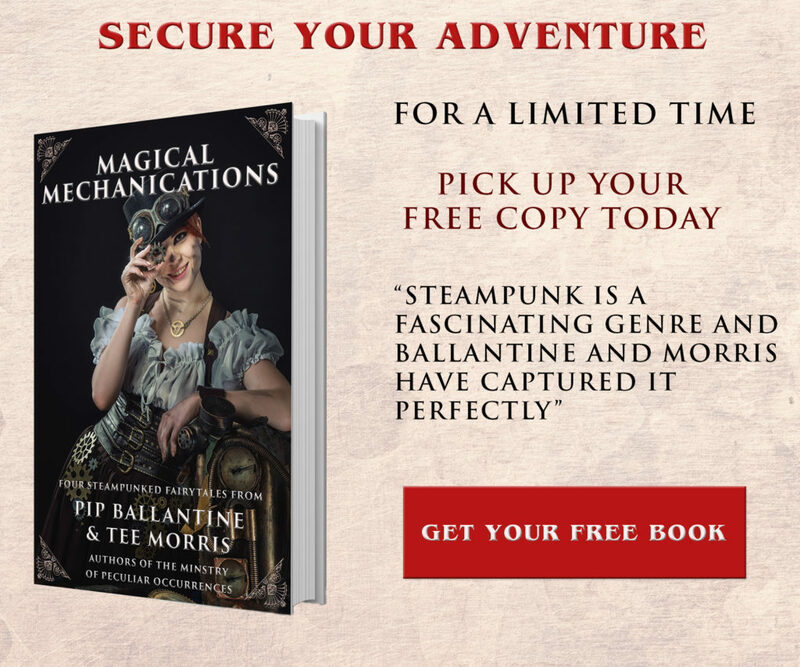 When demon hunter, sorceress and samurai, Raisa falls into a strange, odd version of Victorian England, she finds herself in the domain of the Ministry of Peculiar Occurrences. Foothold by Paul Ellis. Venture back to the beginnings of the Ministry, where a young man named Rowan Clayworth finds himself trapped between love and an eldritch danger. Tales from the Archives are short stories set in the world of the Ministry of Peculiar Occurrences. This volume includes: Spiritus Sanctus by Alyson Grauer. Emily Cassidy Tuttle, on word from Doctor Sound, arrived in the shadow of the Vatican to receive a mysterious parcel from a local contact. The Mummy of Barnsley by Michael Ventrella. Agent Ernest Throckmorton is called to Barnesley to investigate reports of a Mummy terrifying the town. The Black Empress by Katharina Bordet. When two agents from the Ministry of Peculiar Occurrences are called to Vienna to investigate disturbances at the palace, what they discover could threaten the Austro-Hungarian Empire and shatter the fragile peace in Europe. Down by the River — written by Tim Dodge. Agent Brandon Hill of the Ministry meets Agent Bill Wheatley of the Office of the Supernatural and the Metaphysical in Afton, New York. The House of Usher is moving a large and dangerous weapon through this small town, and it is up to the agents to track it down. Tales from the Archives are short stories set in the world of the Ministry of Peculiar Occurrences. This volume includes: To Hide in Plain Sight by K T Bryski. Elizabeth Sinclair, working on the fringes of the Ministry of Peculiar Occurrences, is called in to find a thief. Old Sinner’s Bones by Scott Roche. Agent Edouard St. Just arrives in a rather weather soaked Clontarf Castle, and finds himself immediately surrounded by the incidents that have been plaguing the residents. Tangi a te Ruru / The Cry of the Morpork. Agent Aroha Murphy investigates a series of strange deaths in the wilds of New Zealand in 1873 which have all taken place on one night. Are they suicides or murders? Aroha with her Maori and Italian ancestry, sits awkwardly between two cultures, but the answer is tangled with her own complicated past. heritage of Aotearoa itself. Beneath Northumberland by KT Bryski and PC Haring. Taking pity on the plucky intern in the Archives of the Ministry of Peculiar Occurrences might not have been the best choice for Agent Brandon Hill. What seemed like a simple kindness has brought him to the bottom of the Northumberland Straight, and into a very peculiar kind of Canadian danger.